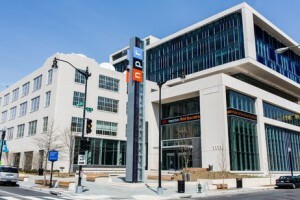 In spring 2013, NPR moved into its new headquarters in Washington, D.C. The building incorporates multiple vibrant visual aspects overseen by design consultancy Poulin + Morris Inc., including a large mosaic videowall, elevator lobby digital signage, and a digital tower and ticker screens located outside. Scala digital signage software manages, schedules, and delivers content to all the various elements of the installation. The project was deployed and managed by Scala Certified Partner, Imperatives, Inc. The underlying digital signage player hardware is a mixture of rackmount and mini-PC Nexlink systems from Seneca Data, configured with graphics cards from ATI and NVIDIA. The showpiece is the ‘Mosaic Media Wall’, an impressive floor-to-ceiling videowall comprising rectangular arrays of Sansi LED screens of various sizes. The Sansi screens, with their high pixel density and high brightness and narrow bezels, deliver stunning HD images with impact, making them ideal for videowall applications. Outside the building is the iconic ‘NPR Icon Tower’ – an imposing 55-foot tall feature that is a local landmark indicating the entrance to the lobby and designed with pulsing LED lighting to represent sound waves. On the exterior of the building are ticker screens that continuously display three different RSS news feeds. 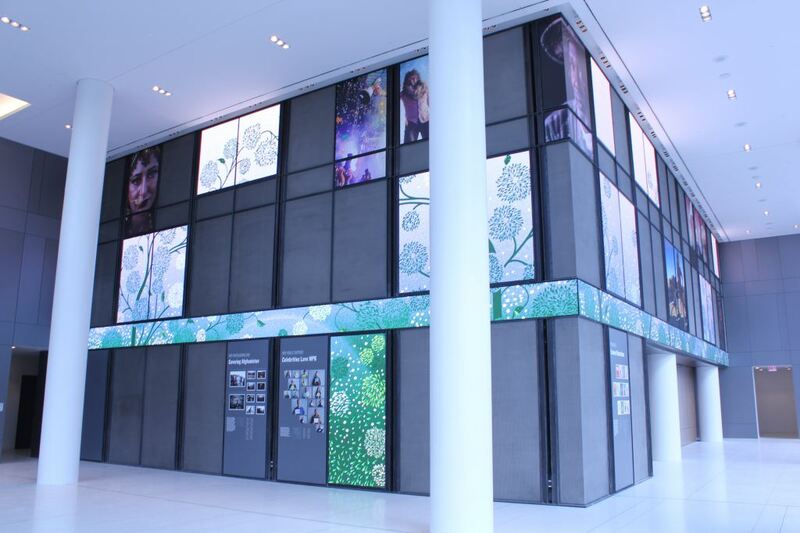 For the Mosaic Media Wall, Scala software allows a variety of information and information types such as music, arts and life, and news to be displayed on partial, single, or multiple screens within the wall. The software enables the simple grouping of items according their classification, using text or still/moving images, with the option to have ticker information overlaid. Formatting is dynamic with words and images fading in and out, appearing from the side or scrolling in, to guarantee continual visual interest. Scala also allows NPR to schedule different information to appear at specific times of the day. Music content, for example, might be scheduled to run at 20 minutes past every hour. NPR is able to set the start and end time and date for a particular item, allowing control over how long a story is shown before it is replaced with another one. The software’s flexibility and ease of use means that the organization can take full advantage of the functionality Scala provides. Imperatives designed and implemented the necessary scripts, templates and schedules at the outset and then trained NPR staff how to use, modify, and create their own. This allowed NPR to become completely self-sufficient. Scala’s software provides the means to map NPR’s content across the patchwork of LEDs within the Mosaic Media Wall, allowing the development of distinct visual expressions across the LED modules for each section that correspond to the NPR website. The templates are built within the Scala system in a way that maintains the integrity of the Poulin + Morris design standards, but also provides flexibility for NPR to regularly adjust content. For the Icon Tower in front of the building, Scala’s flexibility enables a rotating animation in different colors – reducing or increasing the opacity of the logo according to the prevailing light conditions. 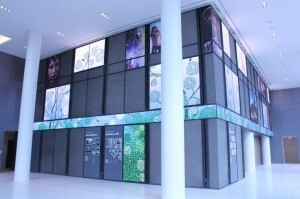 Beyond this, Scala controls the three ticker feeds on the front of the building, synchronizing their content with that displayed on the Mosaic Media Wall. Back inside the building, Scala controls a display situated outside the lobby elevator, which is exclusively used for corporate and employee communications.